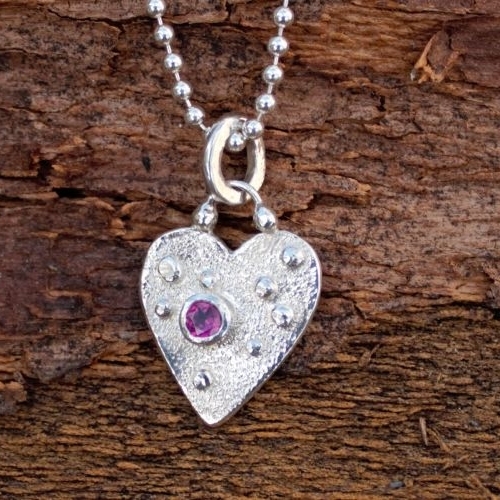 The pretty Rhodolite is a beautiful deep pink faceted gemstone which measures 3.5mm across. 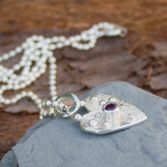 The Heart is made from solid silver sheet and has little balls solid silver balls soldered on top, there is also a little dimpled texture to the surface which catches the light beautifully. I have only made one, so it's a one of a kind once its gone its gone. 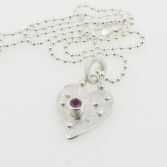 The Heart is supplied with a 2.0mm solid silver ball chain which is 16 inches long. 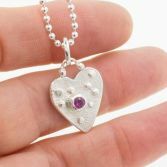 It can be supplied with an 18 inch chain just let know. 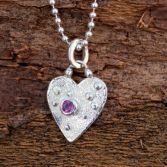 The Heart measures 28mm in length including the bail and is 17mm across the widest point. 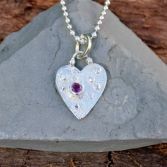 Your Rhodolite Gemstone Heart Necklace will be presented in one of my signature gift boxes and posted via Royal Mail 1st class signed for delivery to any UK address free of charge.